(CBS News) - A report published in Injury Prevention shows that suicide rates among U.S. Army personnel increased 80 percent between 2004 and 2008. Out of the 255 soldiers who had committed suicide between 2007 to 2008, 17 percent of the soldiers had previously been diagnosed with a mental health problem. Fifty percent had visited a health professional for a mental issue. "While suicide remains a relatively rare event, the results of this study suggest it is increasing at an unprecedented rate and, unlike any other time in history, U.S. military suicide rates now appear to have surpassed those among comparable civilian populations," Dr. Simon Rego, a supervising psychologist at Montefiore Medical Center in New York City, told HealthDay. "It is therefore critical that we address this emerging public-health problem." Rates of mental health issues like anxiety, personality disorders, substance abuse, and post-traumatic stress disorder (PTSD) among soldiers correlate to the suicide increase, the researchers said. It's a problem that has existed since soldiers have returned from deployment, but Dr. Joseph Hullett, a board-certified psychiatrist who is also a Vietnam-era Marine, believes it's only going to get worse. He says the problem is that combat exposure during the Iraq and Afghanistan wars was very high, meaning more soldiers are likely to suffer from mental health problems. "There are people in the service right now who are remaining in the service who probably have the kinds of multiple deployments and multiple year combat situations that make them vulnerable," Hullett, senior medical director of clinical strategy for Optimum Health, Behavioral Solutions, explained to Healthpop. According to the United States Department of Veterans Affairs, 7 to 8 percent of the U.S. population will have PTSD at some point in their lives. About 5.2 million adults are affected every year -- and not all of them have gone through a traumatic event. When it comes to people in the military the numbers increase. For every 100 Iraq and Afghanistan war veterans, 11 to 20 of them will have PTSD, and female soldiers are overrepresented. Not only are women more likely to get PTSD, 23 percent report sexual assault when in the military, and 55 percent say they have experienced sexual harassment, factors that can add more stress to an already stressful situation, according to the department. A 2008 study found that there was a link between PTSD and extreme stress or trauma associate with war, and many soldiers will turn to alcohol to cope with their problems, Medscape reported. The study found 63 percent of Reserve or National Guard solders were more likely to start heavily drinking, with nearly 26 percent participating in binge drinking after deployment. Women were 1.2 times more likely to start drinking heavily, but less likely to report alcohol-related problems. Younger troops, reservists and National Guard members were the most at risk. During Hullet's era, he heard stories from returning soldiers who said they would tell others that they wanted to commit suicide, only to have their problems dismissed by their non-commissioned officers. Hullett, who did not serve overseas himself, said some NCOs would even tell the soldier to use their gun or take some poison, thinking that this form of intimidation would dissuade the person from taking his or her own life, he said. "There is this macho attitude of not receiving help in the military," Hullett said. "That kind of culture, people feel they don't have the kind of resources (available to help them), even though they do." Methods in treating at-risk soldiers however have changed since Vietnam, and Hullett applauds the military's current efforts for providing mental health services. He's noticed how all branches are working to make soldiers and veterans more aware of how to respond and recognize people who may want to commit suicide and says there are more resources than ever through local VAs and 24-crisis support hotlines. It's not only the time in the service that makes it difficult for soldiers: It's returning back to daily life, either after the war or between deployments. Many times a PTSD-affected individual may not show signs for three to four months after coming home. Hullett said there is a natural period of decompression after returning from combat zones. "The fact is you have changed when you come home, and your family has changed too," he said. "If you were a male that was in the service when you were 18, you may not know the family you left behind, and your family is a stranger to you," he added. Because so many soldiers refuse to talk about their experiences, it can be difficult to find out if something is wrong. Hullett said family members should be aware if their loved one starts displaying symptoms of PTSD, which include startled responses, hypervigilance, nightmares, general overall anxiety or fear and flashbacks of experiences, which may be similar to hallucinations. Other symptoms include being numb to one's surroundings (also known as the "thousand-yard stare"), clinical depression, shame and survivor's guilt. Hullett said it is of the utmost importance that veterans and their family members recognize if someone was suffering from PTSD and get help before it was too late. It's not easy though for returning veterans, many of whom become isolated. He emphasized that it was important that both sides reach out to each other. "(Veterans) need to be in a situation where they can talk with people," he said. 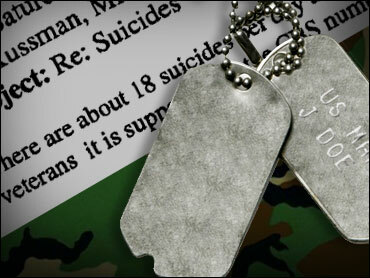 The National Center for PTSD of the U.S. Department of Veteran Affairs has more.